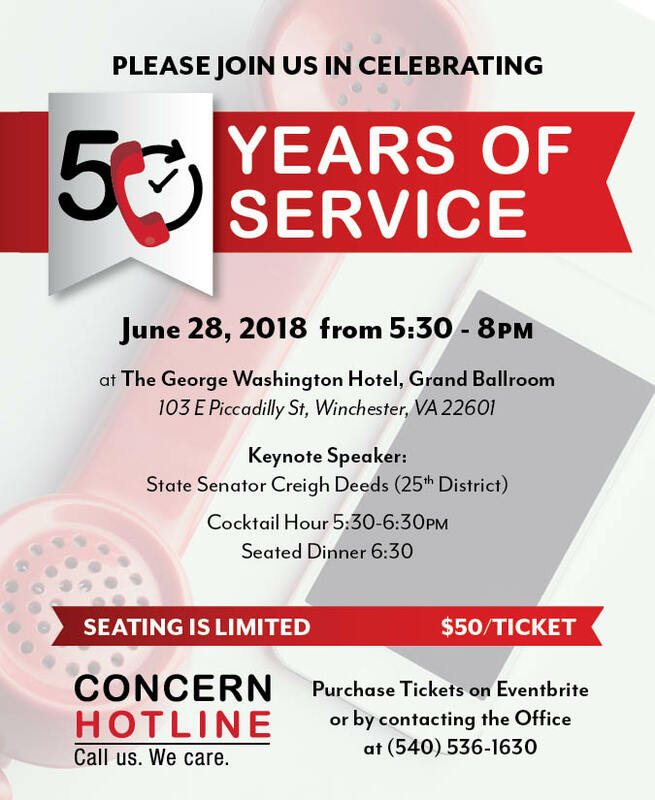 Concern Hotline welcomes State Senator Creigh Deeds (25th district) as our keynote speaker to help us celebrate 50 years of serving our community! Come enjoy our Social Hour and Dinner as Winchester's premiere facility, The George Washington Hotel's Grand Ballroom. Concern returns to its roots at the George! Social Hour begins at 5:30 followed by a seated meal at 6:30. We will be announcing our newest Memorial Fund, and some exciting news to kick it off! Please come join us for this special evening! We are very honored and proud to have senator Deeds join us for this special night! Senator Deeds has represented the 25th District (which spans from his home in Bath County to the City of Charlottesville) in the Senate of Virginia since December 2001. Prior to his service in the Senate, he served as a local prosecutor and 10 years in the House of Delegates. Sen. Deeds currently sits on the Courts of Justice, Privileges and Elections, and Transportation Committees. He chairs the Joint Subcommittee to Study Mental Health Services in the 21st Century. Senator Creigh Deeds represents the 25th Senate District, which includes the counties of Albemarle (part), Alleghany, Bath, Highland, Nelson, and Rockbridge, and the cities of Buena Vista, Covington, Charlottesville, and Lexington, and part of Albemarle County. He serves on three Senate standing committees: Courts of Justice, Privileges and Elections, and Transportation. Senator Deeds' public service career began in 1987 when he was elected to serve as the Commonwealth's Attorney of Bath County. In 1991 he ran against an incumbent and won in the 18th District in the House of Delegates. After serving 10 years in the House, Sen. Deeds was elected to the Senate in a special election in 2001. Senator Deeds was the Democratic nominee for Attorney General in 2005 and for Governor in 2009. Senator Deeds chairs the Joint Subcommittee to Study Mental Health Services in the TwentyFirst Century. He also serves on the Small Business Commission, the State Water Commission, the Joint Commission on Transportation Accountability, and the Joint Committee to Study Interstate 73. The National Alliance on Mental Illness honored Sen. Deeds with the Richard T. Greer Advocacy Award for his efforts to reform mental health, and the American Psychological Association Practice Organization named him the 2015 State Legislator of the Year Award. His advocacy work has also been acknowledged by NAMI — Virginia, the Psychiatric Society of Virginia, and the American Foundation for Suicide Prevention. For his work on behalf of crime victims, he was awarded the Warren Stambaugh Award from Virginians United Against Crime. He also has received the Leadership in Public Policy Award from The Nature Conservancy, the Preservation Alliance of Virginia Delegate of the Year, and the Virginia Association for Parks Legislator of the Year. His legislative work and accomplishments have also been recognized by the Fairfax Coalition of Police, the Virginia Conference of the American Association of University Professors, Virginia Education Association, BikeWalk Virginia, the Virginia Professional Fire Fighters, and the Virginia Community Healthcare Association. Senator Deeds attended Virginia's public schools and graduated from Bath County High School in 1976. After completing undergraduate work at Concord College, he received his law degree from Wake Forest University in 1984. Senator Deeds is a lawyer in private practice and lives in Bath County with his wife, Siobhan. He has four children.